← Happy International Flash Fiction Day! Winners of FLASH MOB 2013 are up! Those are the words of encouragement I often tell myself and other writers. Don’t give up when rejections arrive. They are a sign that you are sending stories out, and that’s a good thing. A rejection is an opportunity to look at a story again, and perhaps to revise it. Sometimes, a story isn’t quite ready on its first time out, and having it come back is a good thing. Sometimes, it is ready but it just isn’t quite right for the journal it was sent out to. 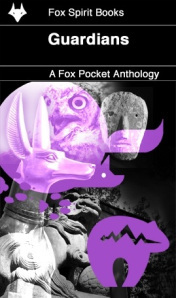 Fox Pockets are “Small but perfectly formed collections of stories by a den full of talented writers, put together by Fox Spirit books for your enjoyment.” (See Fox Pockets for more info.) Cover art for the entire collection is by the talented Sarah Anne Langton. Many thanks to editor Adele Wearing for giving my story a home. Fox Pocket volume 1, Piracy, is already available as an ebook and in paperback. No space between us, a prose poem, will appear in the opening issue of Blue Fifth Review for 2014. I’m grateful to editors Michelle Elvy and Sam Rasnake for giving this piece a home in BFR’s online site, the Blue Five Notebook Series. BFR’s selections are “limited to five written works and a single piece of art per issue. This entry was posted in Fiction, News, Publications, Writing and tagged Adele Wearing, Blue Fifth Review - Blue Five Notebook, Flash Fiction, Fox Pockets, Guardians, Impossible Spaces, Margret Helgadottir, Michelle Elvy, Sam Rasnake, Sarah Anne Langton. Bookmark the permalink. 11 Responses to Keep Writing! Keep Sending it Out! Thank you for the kind words, Chris. 🙂 Very grateful for all your support and help. I’ve learned so many things about writing and the writing business from you. And yay! Awesome to be on same ToC twice. Let’s make this a habit 😉 Happy you’ve had good fortunes now and truly inspiring to read how you keep up the good spirits when you receive rejections. Yes, do let’s make this a habit! 🙂 Thanks for your kind comments, Margrét. Superb Chris, raising a glass in your honour! Thanks, Susan! Raising one in your honour too, for your recent successes! Here’s to many more. Congratulations! A great July for you. I had to laugh when I read the bit about sending out too early. I always swear I’m going to work a story until it’s ‘perfect’ but then get caught up in the wonderfulness of the draft I’m on and send it out – only to realize the story is still evolving. But somehow, having it rejected does help me look at the story more critically. Funny how a story can seem great while we are writing it, but then when we come back to it later, we can see clearly all the little problems we hadn’t noticed. Good to get some distance. Congratulations on all your recent publications! Very cool to share TOC with Ramsey Campbell! You are so right about submitting and rejections. Best of luck with all your current writing projects and submissions! Thanks, Berit! Yes, cool indeed! Several great stories in this anth. Best of luck with all your projects too. Looking forward to your next publication. Thanks for dropping by and reading, Quirina. Your very kind comments are always appreciated.